Shirzad Ahmed knows what it’s like to be a refugee — stateless and far away from family and friends. At the age of 18 he was a political exile from Kurdistan, an area of northeast Iraq that suffered great oppression under the regime of Saddam Hussein and continues to be mired in poverty today. He knocked on the door of 13 countries before gaining temporary refuge in Italy and a permanent home in Canada. Ahmed is now a lawyer in Calgary whose own door is open to countless refugees fleeing persecution from every corner of the globe. Because he enjoys helping people and has an extremely strong sense of duty and human compassion, he often helps them for free and even pays their court costs out of his own pocket. The youth who left his home country had many experiences on the way to becoming the lawyer who was honoured with the Alberta Order of Excellence for his pro bono humanitarian work. But perhaps the most life-changing one was the two-year stint he did at what was then called the University College of the Fraser Valley, where he launched his post-secondary studies at the age of 30 in 1992. In recognition of his humanitarian work as a lawyer and while he was a student, Ahmed has been chosen to receive the Distinguished Alumni award at the University of the Fraser Valley for 2011. 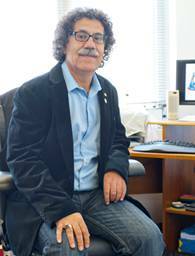 He will receive his award Sept 20 at the UFV awards ceremony at Abbotsford’s Ramada Inn. Retired UFV administrator Erling Close nominated Ahmed for the award. Although he finished his Bachelor of Arts at Simon Fraser and earned his law degree at the University of Calgary, UFV (then UCFV) was where he began his university studies. Ahmed was a student at UFV for two years in the heady days when the institution had recently received degree-granting status and was working on developing its own degree programs. Faculty who had been around for a while were excited about the prospect of teaching upper-level courses, and a large contingent of new faculty was being hired every fall. Ahmed remembers other student leaders such as Lori MacIntosh, David Thiessen, Rebecca Andreson, Taryn Thomson, Dianne Schwartz, and Robin Price, and holds a special fondness for some extremely mature students such as Guy Rushton, and Viola Southgate, who were in their 60s and 70s when studying at UFV. As for faculty members, he recalls being inspired by Scott Fast, Eric Davis, Kevin Busswood, Jeff Morgan, Jack Gaston, Elizabeth Asner (now Dennis), and John Carroll. While at UFV Ahmed co-founded a chapter of Amnesty International, and was a frequent visitor to management and board meetings, bringing forth ideas about how to improve the rapidly growing institution. It was a time when there were very few boundaries between administrators, students, faculty, and staff. While he was completing his BA at SFU, Ahmed was appointed to the UFV Board as a community representative, and continued to shape policy and have input into the development of the university college. Dr. Eric Davis, who is now UFV provost and vice president academic , taught Ahmed back when he joined UFV as a history faculty member. His law professor from the University of Calgary, Ian Rounthwaite, concurs. Rebecca Anderson, a fellow UFV alumna who attended at the same time as Ahmed and who is also now a lawyer, recalls meeting people who were inspired by him. In addition to being a human rights activist and providing free legal services to many refugees, Ahmed has written extensively about human rights. She lists women fleeing genital mutilation in Kenya, gay men fleeing persecution in Nigeria, conscientious objectors seeking refuge from Ethiopia and Somalia, women running away from sexual slavery in and enforced prostitution in Yugoslavia, people fleeing persecution for membership in the Falun Gong religion in China, and many other examples of people he has helped. Ahmed received the 2008 Distinguished Service award in Pro Bono Legal Service from the Law Society of Alberta and the Canadian Bar Association. In 2009, he was inducted as a member of the Alberta Order of Excellence. He was also recently chosen to lead graduands in reciting the graduate’s pledge at a University of Calgary convocation ceremony. Ahmed lives in Calgary with his life partner, Yvette Kroeker, whom he met soon after coming to Canada in 1984. He recently returned to Kurdistan for his first visit in decades, and while he was happy to see his family and friends and the landscape of his home, he was saddened by the “heart-breaking” poverty. He’s now lobbying the Canadian government to establish a consulate there. 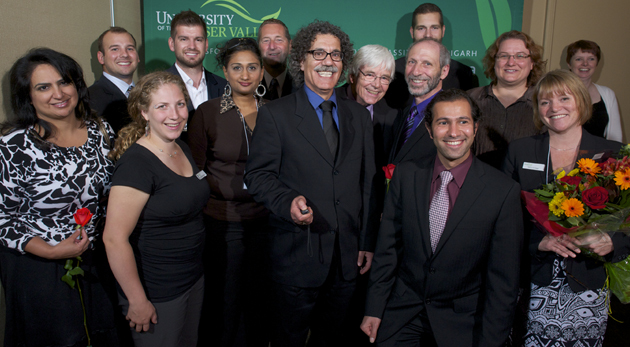 Shirzad Ahmed with members of the UFV Alumni Association board and other friends. Photo available upon request. Interview with Shirzad Ahmed also available upon request (via phone or email, or he will be on campus Tues, Sept 20).